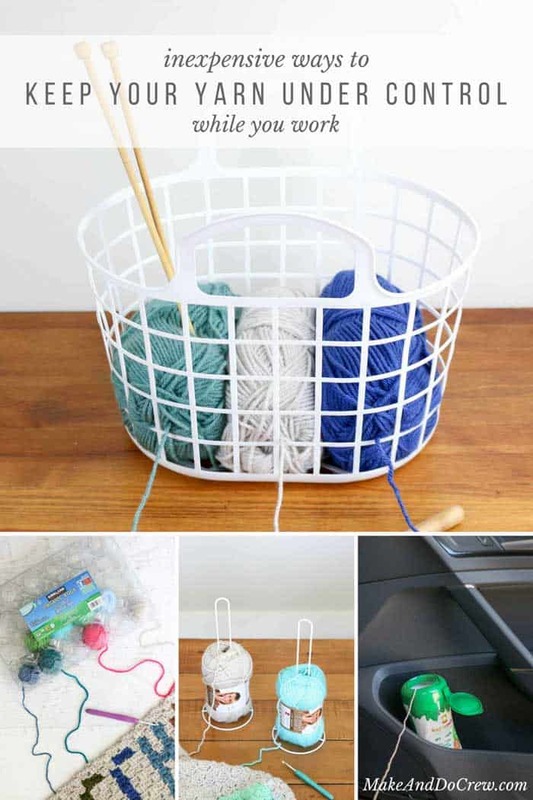 If you like to spend more time knitting or crocheting than untangling yarn, this list of DIY yarn holder ideas using household objects is for you! I’m not sure there’s anything worse than sitting down to what you think will be a good knit or crochet sesh and instead spending a half an hour getting your yarn straightened out and organized. So annoying! Since I started learning how to corner-to-corner crochet, it’s become imperative to find ways to keep my yarn organized while I work. 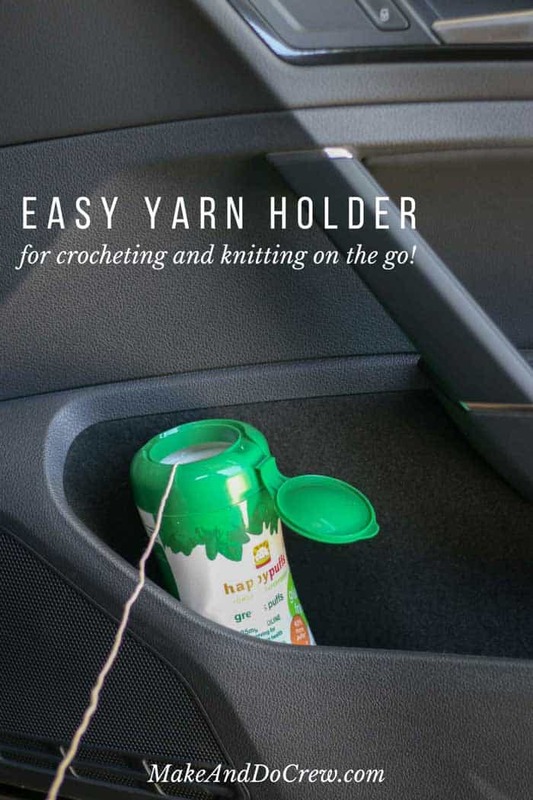 If you often knit or crochet with multiple colors or just want to keep your yarn free of pet hair and crumbs, these DIY yarn holders could offer a lot of help. Don’t limit yourself to this list though. If you’re like me, there are a ton of “treasures” laying around your house just waiting to be monopolized by your yarn hobby! One helpful note: Many of these DIY yarn holders work best when you start the skein from the middle instead of the outside of the ball. 1. 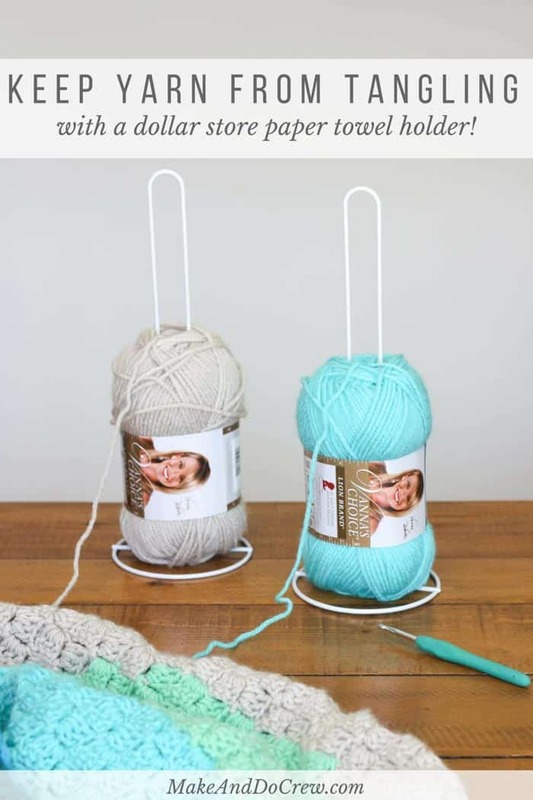 Dollar Store Paper Towel Holders – I recently came across these paper towel holders at Dollar Tree and wondered if they’d make good yarn holders. Turns out, they totally do! For just a dollar each, this is an awesome way to keep your yarn organized for c2c crochet projects! 2. Beefed Up Dollar Store Yarn Holders – While the paper towels make effective yarn holders for smaller or lighter skeins, it’s helpful to have an option that can support a larger skein like Lion Brand’s Thick and Quick Bonus Bundles. I’ve noticed a lot of these bigger balls slip apart more easily, and this simple hack using a dollar store chalkboard to stabilize the paper towel holder will keep your yarn organized while you work. 3. 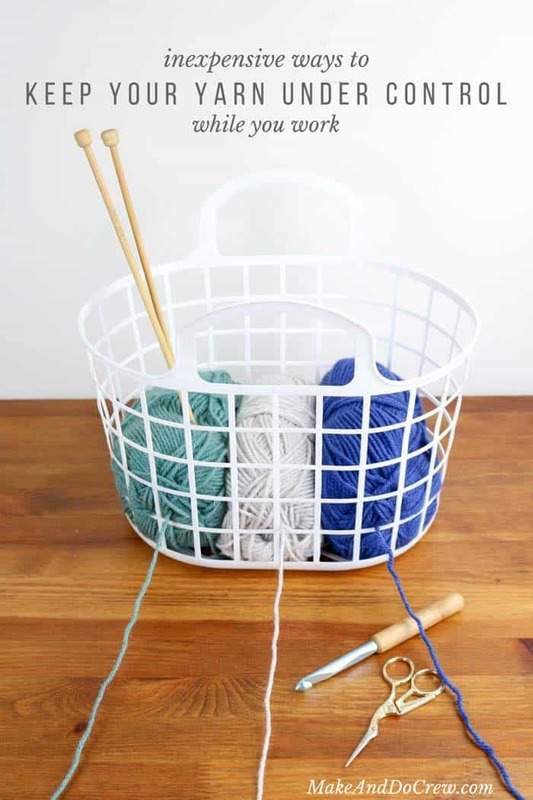 Easy Basket Yarn Holder – Knitting or crochet projects that use multiple colors can get unruly fast. (C2c crochet, I’m talking to you !) Popping your skeins in a basket and threading the yarn through a hole before you start will help each skein behave while you work. 4. 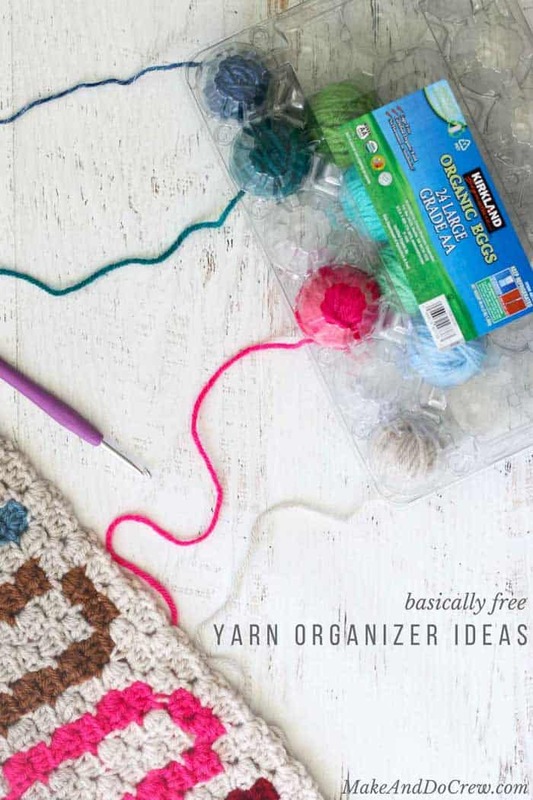 Egg Carton DIY Yarn Holder – Often a project with color work doesn’t necessarily require a lot of each yarn, but rather small sections of many different colors. 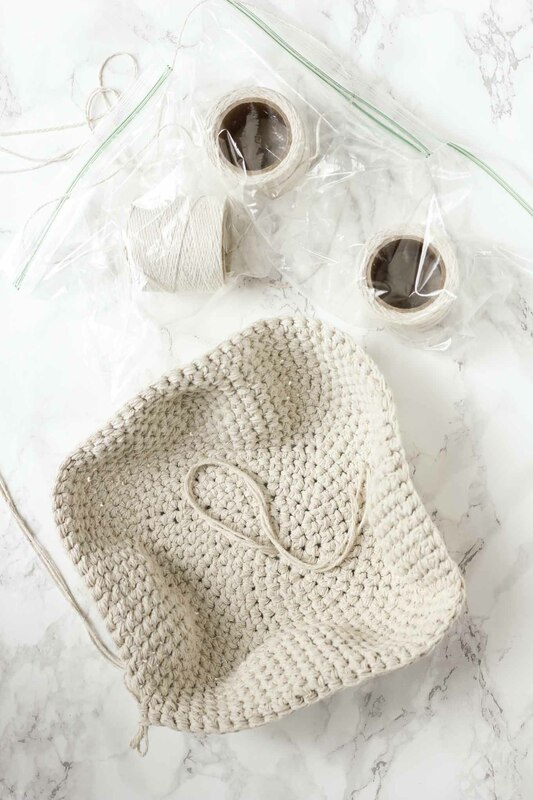 If you roll up small balls yarn, pop them in a plastic egg carton and snap it closed, they easily unwind without getting tangled while you knit or crochet! A bonus is that you can keep all your extra balls that aren’t in use organized in the other egg carton compartments. 6. DIY Yarn Bobbin Holder – Inspired by some we had seen on Etsy, my dad made me this wooden yarn bobbin holder for Christmas. 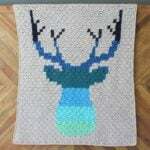 (Of course, it was right after I finished my Christmas C2c afghan! I certainly could have put this to use for that project.) The bobbins can even be moved around to accommodate different skein sizes. 1 Dog Woof has a tutorial on how to make your own here. 7. Zip Loc Bag Yarn Organizers – I’m guessing this is a trick a lot of us have used at one time or another. Putting each ball of yarn in its own separate bag and zipping it almost all the way closed is especially helpful is you’re making a project with multiple strands of yarn held together. This bag is what I gave my mom for her birthday. It’s really generously sized and the slits on the top will help you keep a couple full-size skeins organized wherever you find yourself knitting or crocheting. 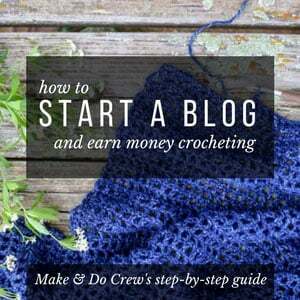 * Thanks so much for using my affiliate links and supporting free patterns on Make & Do Crew! How do you keep your yarn organized while you’re knitting or crocheting? 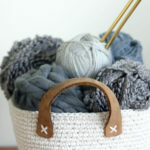 I’d love to hear your hacks for making DIY yarn holders! 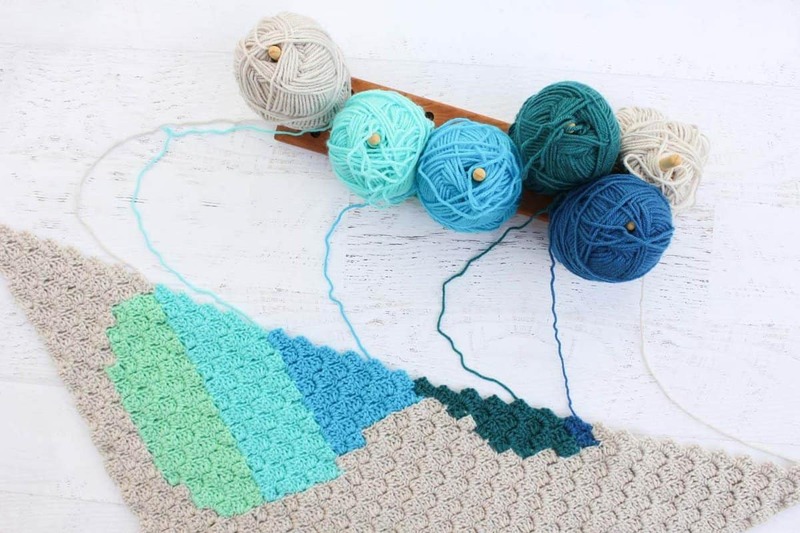 And now that your yarn is organized, would you like to see how to make a blocking board with items from the dollar store? Brilliant! The paper towel holder is perfect. I can’t wait to use these ideas. Thank You. I use the resuable grocery store wine bags – skeins fit in the compartments, with scissors and a pencil in another compartment. The bag goes into a regular reusable grocery bag, which gives me room for my pattern, etc. I love using yarn bras, but they can get expensive. A few years ago in my area, cherry tomatoes were sold in similar mesh sleeves. I cut the ends off washed them and they work great. I like them because the shrink down with the yarn skein as it gets smaller. Empty Lysol or Clorox wipes containers work great too. Just close the lid when you are taking a break and your yarn is safely stored. The paper towel holder is brilliant! Thank you. Sometimes I just don’t want to take the time to wrap the yarn into balls! But, when I do, the large plastic coffee containers work well.